♥My major is English Linguistics and Literature. 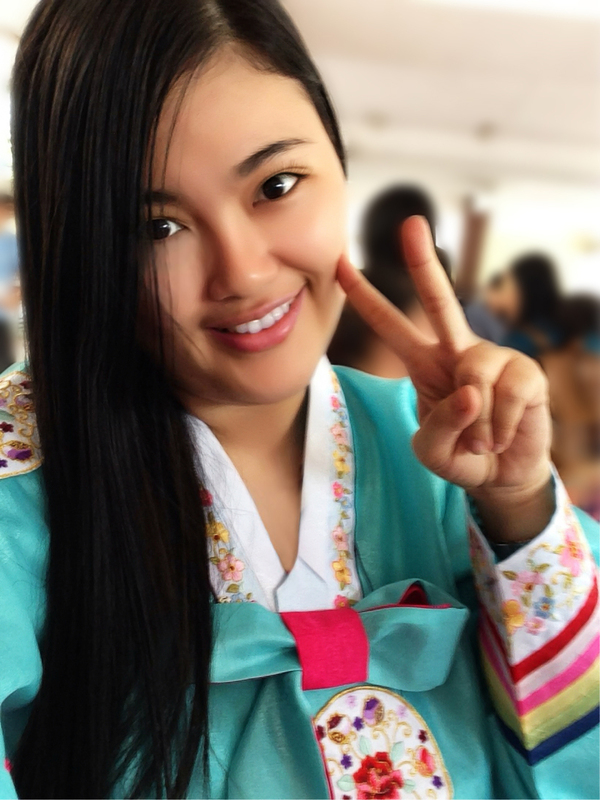 ♥I am also fond of Korean and Chinese Culture. ♥ I love Vietnamese Culture and Food. My favorite foods are Banh xeo and Bun bo Hue. ♥ I am engrossed in K-POP and K-Drama. SNSD is my special inspiration and motivation. ♥ I am interested in Chinese historical Dramas. Hey! Thank you so much for commenting and liking (so many) my posts 🙂 You’ve also given me the most likes of one day so I thought I’d return the favour and look at your blog. You should write in your description by the way! Thanks for letting me know. I will check your new blog. Hello Angeli ^^ Your name is very beautiful. Chị cũng rất vui được làm quen với Trân. Chị học tiếng Hàn được khoảng 2 năm rồi ^^ Em cũng học tiếng Hàn huh? Em học tiếng Hàn gần 1 năm rồi. ^^ Yoona là đẹp lắm hehe. Chị thích ai trong SNSD? :3 Em là Kiss Me và Inspirit. Oh, swanlake1701 @ tumblr là chị phải ko? @ Georgie: Em tự học tiếng Hàn hay học ở Trung tâm? Tại vì em sanh và ờ nườc Mỹ. ^^ Tiếng Anh của chị cũng giỏi! @sweetangel : hiện bạn đang học tiếng hàn ở trung tâm ko ? mình đang dự định đăng kí để học tiếp. À, ban có biêt ở đâu mua được sách topik hay của yonse như sách bạn đã review ko? Mình hiện đang tự học bằng sách của trung tâm sejong mượn photo được 😀 sweetangel có facebook ko? Hiện tại thì tớ tự học cậu ơi. Thỉnh thoảng tham gia mấy khóa học hay giao lưu ngắn hạn miễn phí thôi. Mấy sách đó ở Hàn Quốc có bán chứ Việt Nam ko có bán đâu. Thường thì tớ nhờ bạn người Hàn mua hộ hay mượn sách của bạn tớ. Thank you for dropping by, liking my posts, commenting and following my blog 😀 (that’s a lot!) I found your blog interesting too, so I’m clicking that ‘follow’ button now. I am very happy to receive your comment. ^^ I am looking forward to your new entries ^^ Your blog is very interesting and useful. I will try some recipes from your blog . Hi there gal.. thanks for liking my post and following my blog..
I’ve always wanted to learn korean language but I don’t have spare time to focus on it in the meantime.. I have tried learning the basics though which is the alphabet..
Hello ^^ Nice to meet you. I am very happy to find a friend who is interested in Korea like you. I really love the reviews of Korean songs, videos, movies on your blog. ^^ I am looking forward to your new entries. Happy blogging gal!!! hope to see more of your post soon..
Hello, Kay. I am very surprised to be nominated ^^ Thank you so much for your consideration. I will try to write more interesting and helpful entries ^^. I nominated you for the Libester award! I hope you answer the questions!! Hello Kess, nice to meet you. I’m sorry for the late reply. THank you so much. I will try to find time to answer your questions soon. Thank you for the likes and the follow. 열심히 공부합시다~! Nice to meet you too. I’m glad that you find my blog helpful. Hi there! Thanks a lot for stopping by and becoming a follower of justinseason and liking my latest post. Love your picture and the beautiful red dress. Nice to meet you. It’s a great pleasure to find an inspiring and interesting blog like yours. you’re welcome ^ ^ Thank you. Hi, thank you for liking my Ye Dang Korean Restaurant Review entry at backpackingwithmishi.wordpress.com. I hope you enjoyed reading it and learned few things about Korean food. Hi fellow Vietnamese. Thank you for visiting and liking the posts on my blog! =D I also love Banh Xeo and trying to cook more Vietnamese food at home. Love your blog! I’ve nominated you for the “Oh So Fabulous award”, you can view the details at http://chefdm.com/2013/09/17/the-oh-so-fabulous-award/, Congrats, and happy blogging! I really like to read about your experiences and adventures in Korea. I would really appreciate it if you could help me spread this post as we are currently fundraising for Bohol’s recovery. Thank you very much!! Thanks for following my blog. I’ve followed yours back. 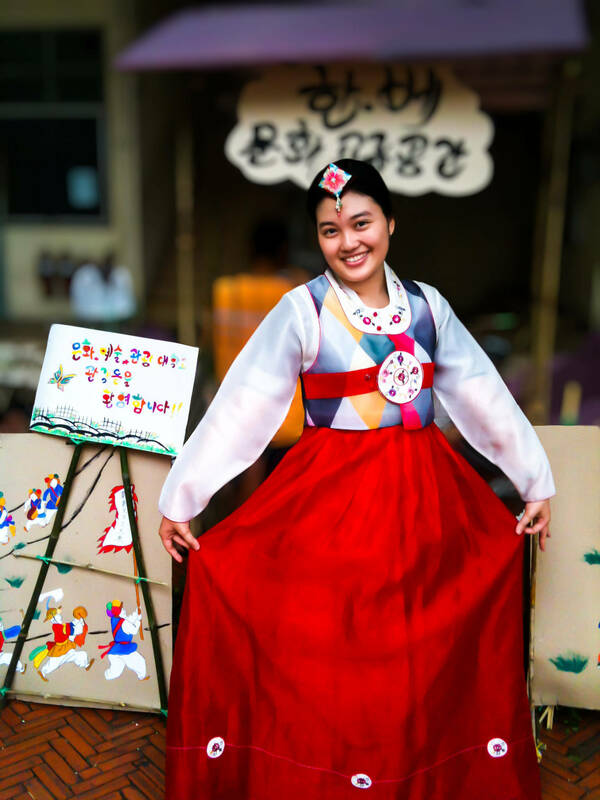 It has been my great and unexpected joy to discover that just by starting a blog a month ago because I wanted to learn the Korean language, that I am getting to discover all these interesting people who also like Korean drama, linguistics, and the Korean language. I had a dual major in college – English and Computer Science. My favorite course was Rhetoric. I’ve had a life long love affair with books, words, and meeting people around the world. So very happy to have discovered you and your blog. Thank you so much for visiting my blog. I’m also happy to know another fellow blogger who is passionate in Korean language and culture. After reading some of your pages and you comments, I’m starting to think you’re the nicest person in the world! I’m going to put a link to your site on my Facebook page and from my site just cause you’re so nice. Hi, Sone. Thanks for visiting my blog. I have been to Ho Chi Minh city 3years ago and I fell in love with the Vietnamese food and culture. Good luck with your language study! Thanks for the follow, good luck with your studies! And oh my goodness, I haven’t read “House of Night” in AGES and I loves the series. I think I got up to book four or around that and got hit with schoolwork and college, but now I’m back to being an avid reader so hopefully I’ll catch up. You look gorgeous on hanbok! Would like to learn Korean (I know about 5 words) but it’s hard to start (and finding the time). Hi, thank you for your compliment. I hope that you can find time to study Korean in the future. I would like to ask you for an advice (about preparing for TOPIK), do you have some SNS pages? If it is possible of course! I don’t want to bother you! Thank you for your compliment. I’m glad that you enjoy my blog. I’m glad to nominate you because I think your blog is very lovely. Koreans love that word, don’t they? I hope you can enjoy this award! Hello! I am really enjoying your blog and especially your photos! Thank you for visiting mine and liking today’s Friday Focus. That’s what brought me to you here and I decided to follow you. I’m looking forward to reading more and seeing more photos! I haven’t seen your blog before and I really like it. I love language and cafes too! I am learning Japanese of course, but I am really interested in Vietnam, Korea and China. And dolls (well, of course I am a doll). Thank you for making your lovely blog. It makes the world a happier place! Well, I enjoyed very much your food pictures (Where can I find some of those recipes (^-^)// ? )… and comments! As for the wine, there’s one sort you could be delighted: a “vin doux” (and there are all sorts of that kind!!). Take very much care of yourself. Hello Delphine, thank you for your comment. I will find time to post some recipes along with the photos. I will try vin doux some day. Thanks for your recommendation. Reading your blog reminds me of many things: art, Korea, university life, life in my early 20s, etc. I hope you’re now in a job that makes full use of your linguistic talents! All the best in the new year. Hey! I’d thought I’d pop over and thank you again for the lovely comments you left on my blog 🙂 You’ve got such a nice blog yourself! 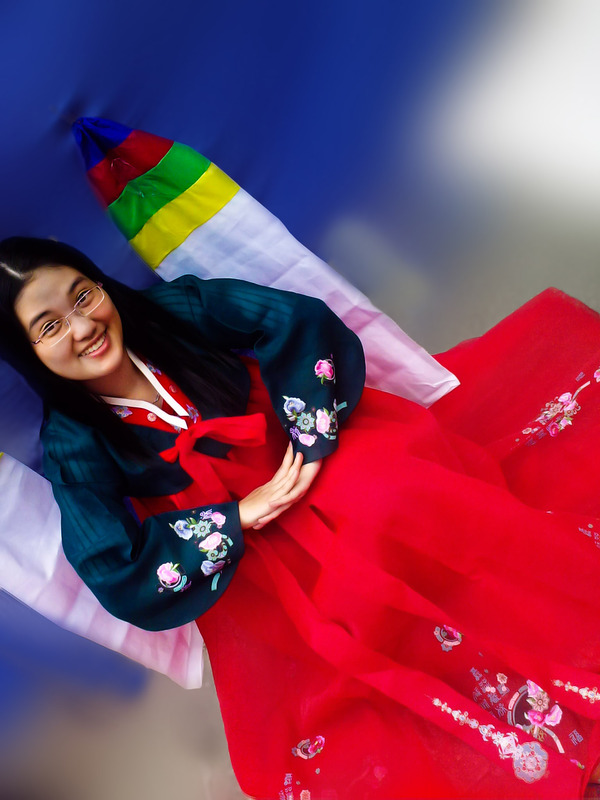 And these are such nice pictures – Korean traditional clothes are beautiful and you look great! Hello Mimmi, I’m very happy when you visit my blog. It’s my pleasure to know your blog. I enjoy your writing and photo a lot. I am looking forward to your blog entries. Hello yMoon, thank you for your comment. 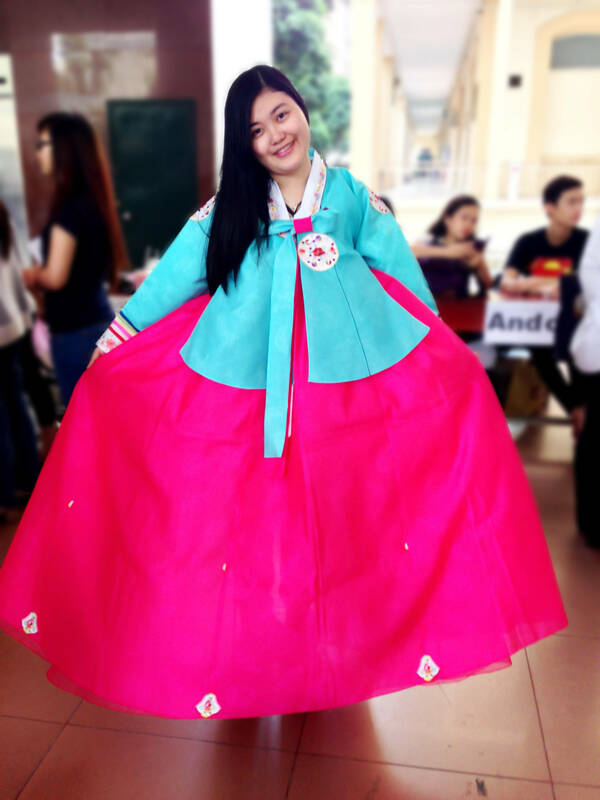 I love Hanboks so much. I’m glad you enjoy my blog. I love reading books so much. I’m glad you enjoy my blog. I am looking forward to your entries too. Thanks for visiting and following my blog @ https://myeyechronicle.wordpress.com. Your blog is very interesting with great beautiful pictures, and now I am also your follower 😃 I am also a great fan of Korean Drama! It’s been a pleasure to read your blog! Thank you so much for sharing so many wonderful photos and tidbits about your beautiful country. Hello ‘The A-Philosopher’s Chair’, thank you for your nomination. You are so kind and warm-hearted. I look forward to more great posts from you! Hello Sofie, thank you for your sweet comments. I love your blog too. Hope that we will become language friends. Hello, thank you for enjoying my A Taste of Haiku blog. I love many things about Japanese, Vietnamese, and Chinese culture. Their homes and clothes in particular. Please, come back more often. And I’ll come back to your blog too. Hello lorac888890, thank you for stopping by my blog. I enjoy your blog and I’m looking forward to your new entries. Thank you for following my blog it was so sweet of you! It means so much to me! I was happy to see we had read the same book series, The Princess Diaries! Do you have any favorite Vietnam book suggestions? I’m always searching out books written by authors in different parts of the world! 🙂 I feel you can learn so much! Have a wonderful day! Hello Danielle Green, thank you for stopping by my blog. I’m glad that we enjoy the same book series. Some of my favourite Vietnam books are ‘Bánh Mì Thơm, Cà Phê Đắng'(by Ngo Thi Giang Uyen) or ‘Venise và những cuộc tình Gondola'(by Duong Thuy), but they are written in Vietnamese. I wonder if you can read Vietnamese books. Ah, I’m curious about them now! Hmm, I may have to see what I can find at my local library on learning Vietnamese! haha. What are those two books about? Hello Danielle Green, these books are about the Europe travel and cuisine. Thank you for checking out my “First Year” post! I’m loving all the pictures, this makes me miss Vietnam! Hi dear! Nice to meet you! I’m Silvia and I’m Italian. Thanks a lot for following my blog! I’m Flattered by your Like especially because you are a language specialist, and my English is still pretty bad!!! Anyway, I will read your blog regularly, to learn how to write better and find more inspirations! Hello Silvia, thank you for stopping by my blog. I like the Italian cuisine very much and hope that I will make some Italian food in the future. Of course You will! Italian’s food is usually Made with Simple (and fresh) ingrdients and not to much word.. Try some of my recipe, they Are foolproof, I promise! Hello Becca, thank you very much for your comment. These Hanboks are very lovely and colourful. I’m impressed by your photography skill. Thank you so much for reading about the Servants of Charity. As you may know we have a house in Ho Chi Minh City. Perhaps you have met Fr. Felicks or Fr. Jerin. Hello, nice to meet you. I enjoy your blog a lot. I’m living in Ho Chi Minh city now. Hello laineyloveslife, thank you very much for your nomination. You blog is fanciful and interesting. I am following you now. Do drop by my blog at https://icareucareblog.wordpress.com at your convenience. Thank you so much, Fun Simplicity. Your blog is full of wonderful things and beautiful writing. I love reading your blog posts a lot.